Description of "Financial Modeling (eBook)"
To use a cliché, we live in a volatile uncertain complex and ambiguous (VUCA) world. setbacks of real world trials and errors. competitive world of corporate finance, investment banking, private equity, or equity research. logical structured and disciplined manner for M&A, VC/PE or Corp Fin teams of conglomerates. Awards 2013. He has a decade of Corporate Finance stint across leading conglomerates in India. 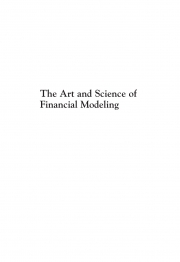 Reviews of "Financial Modeling (eBook)"